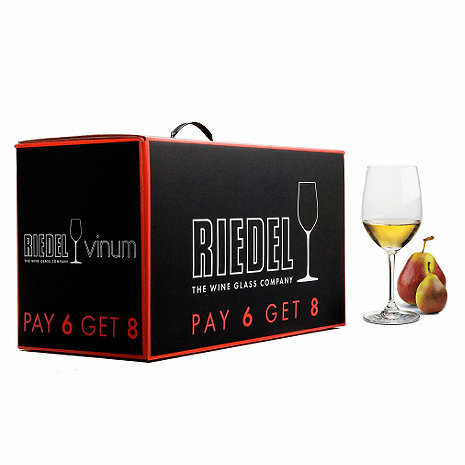 Riedel's best deal ever. Pay for 6, but get 8. Riedel Vinum Wine Glasses make every drop of wine taste its best. Riedel revolutionized glassware by customizing the shape of wine glasses to a particular type of wine. Each wine glass is fine-tuned to direct the flow of the wine onto parts of the palate that will best express the flavors and aromas of a specific wine varietal. Recommended for: Bordeaux (white), Burgundy (white), Chablis, Chardonnay, Chenin Blanc, Pinot (Blanc, Grigio, Gris), Viognier. Riedel Vinum Wine Glasses make every drop of wine taste its best. Riedel revolutionized glassware by customizing the shape of wine glasses to a particular type of wine. Each wine glass is fine-tuned to direct the flow of the wine onto parts of the palate that will best express the flavors and aromas of a specific wine varietal. The fine crystal offers superb clarity so you can experience the wine's color and texture. Moreover, all machine made Vinum stems are completely dishwasher safe. The Riedel Vinum Chardonnay wine glass is perfect for dry white wines, including Chablis and lighter-style Chardonnay. Its narrow rim directs the flow of wine toward the mid-palate, allowing you to appreciate the balance of fruit flavors and acidity. The subtle elongation of the bowl captures the complex characters of the wine's aromas. can i get these personalized ? These are great all purpose glasses. We use them everyday for both reds and whites. We have special glasses for great reds (much larger bowl). They wash well in the dishwasher, and store in a normal kitchen cabinet. I LOVE that they're only 7+ inches. Nothing else will fit in the dishwasher or cabinets! We used to buy Riedel Everyday wineglasses, but they seem to have disappeared from the marketplace. These are our next best choice. (Please bring those back.) Almost all other brands aren't as simply attractive and functional as Riedels. On shipping: not so good. I ordered them "overnighted" and they took 4 days and I didn't have them in time for my husband's birthday. Come on Wine Enthusiast. You can do better than that, or refund my shipping fees. For $50 shipping that was NOT so wonderful. I'll think twice about ordering from this catalog again. Thx. A classy product that projects subdued elegance. Riedel Vinum glasses are my first choice, and I have them for chardonnay, zin, pinot noir and cabernet. A great gift for wine lovers. I believe it is the most universal of the Riedel Vinums. It is the go-to-glass in our cellar. Buying 8 glasses for the price of 6 makes the wine glasses very affordable. the glasses are perfect for chardonnay and other whites. What isn’t to like about riedel? Great quality with guarantee on breakage. Chardonnay glasses are the proper size to enjoy the wine. Very nice white wine glass; good quality - might even make the wi e taste better !! Nice glasses. Good for drinking wine. Can be used for other beverages in a pinch. Excellent size and quality. This size worked well for red wine tasting. Two ounces of wine was enough for a good swirl and adequate savoring. Best wine glasses on the market! We use Riedel glasses every day. The proper glass really does make wine taste better. We have 7 different styles now and will buy more as they come on sale. We can't afford them otherwise. They are delicate, yes, but so worth the trouble. If you love wine, buy these glasses! Very quick delivery. Glasses arrived well-packaged and in perfect condition. These glasses are perfect for the everyday glass of chardonnay, or for entertaining. I only wish I could have bought more than one box at a time. These were a gift for my daughter whose friends are very particular about drinking wine out of the right kind of glasses. These are perfect for her chardonnay-loving guests! Although they are pricey (even with the sale) these glasses are worth it. Great bowl shape and more useful than other gimmicky designs. Can be used for a variety of wines. Will be getting the red wine glasses soon. If you like wine these glasses are a must! Nice glasses for everyday and entertaining. After many uses, no durability concerns or breaking at this point. Am overall very satisfied. Also like the 8-for-6 pricing in the set. The best wine glasses at a great price! We have used Riedel glasses for years and this bargain price just makes them better. These glasses are very reasonably priced for the quality. However, buy a bottle brush to wash them. They are delicate. I love Riedel wine glasses. They are durable, pretty, and wash well! They are pricey but you get what you pay for ! A great bargain on a great wine glass! I like being able to store the glasses in the box they came in. REidel glasses are excellent for wine tastings. inexpensive and durable enough to use everyday; nice enough for the most special occasion. can't beat it. Wonderfully packaged and arrived promply. the best glasses! great deal. These are so perfect. Light, thin elegant glasses. This is my third set of these glases as I have continued to replace them after breakage (clumsy guests not the glasses fault). A great glass and a great valiue. Last yaer I bought glasses for drinking "Cab"...This year for drinking "Chard." Now my table is complete! Great look; great price; wine tastes better in these glasses! The buy 6 get 8 deal is a great way to stock up on these stems, which are a very good quality/value proposition. These are some beautiful looking glasses. Not too big or too small....just right! This is my all-around glass for many different wines. I have several Riedel glasses and I just like this one. No doubt its relatively fragile nature is its main drawback...But, an elegant and beautiful glass. We bought these glasses to replace the crystal wineglasses that we received as wedding presents. We were looking for wineglasses that were light, well balanced, and great to drink white wine with. These glasses fit the bill!! l love the Riedel brand it's nice. A great option as a stylish allround glass. Seems crazy to reserve your best glasses for infrequent occasions. This is a great everyday solution which works well for all styles of red and white. Not too tall for the dishwasher either. Good to hold, good to drink from. Good value. I returned these glasses in the same packageing they arrived in, without even being opened. That was 2 months ago and I still have not received my refund. It was sent with the proper paper work downloaded from the web site etc. No response to my email inquires or requests. Very poor business practices. I will never purchase from this company again. A wonderful addition to my home!